Georgia Dunn Studio: Expectations, reality, family, immortality, and a 117 year old christening gown. 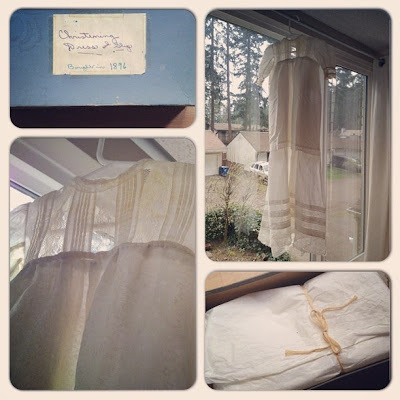 Expectations, reality, family, immortality, and a 117 year old christening gown. 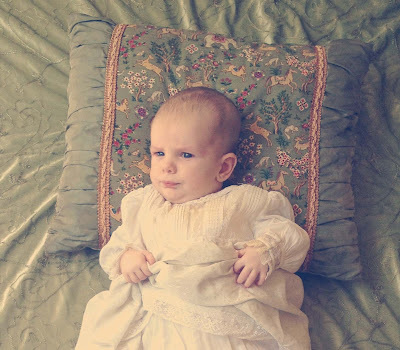 In the weeks before I had Luke, Nana Dee Dee mailed me our family's christening gown. If you read this blog regularly, you know that Nana is a big deal around here. I adore my grandmother. She's a funny, clever night owl who spends her time reading paperback mysteries and listening to her favorite sports teams on the radio. (She's particularly fond of the Red Sox). We share a love of history and family traditions, and the two of us enjoy talking over the various artifacts our relatives have left behind. My great-great Aunt Gertrude's horn rimmed glasses, Nana Irene's china cat with a nodding head, my late Uncle Matthew's sheet music... Nana and I both cherish objects from the past and the memories they carry with them. 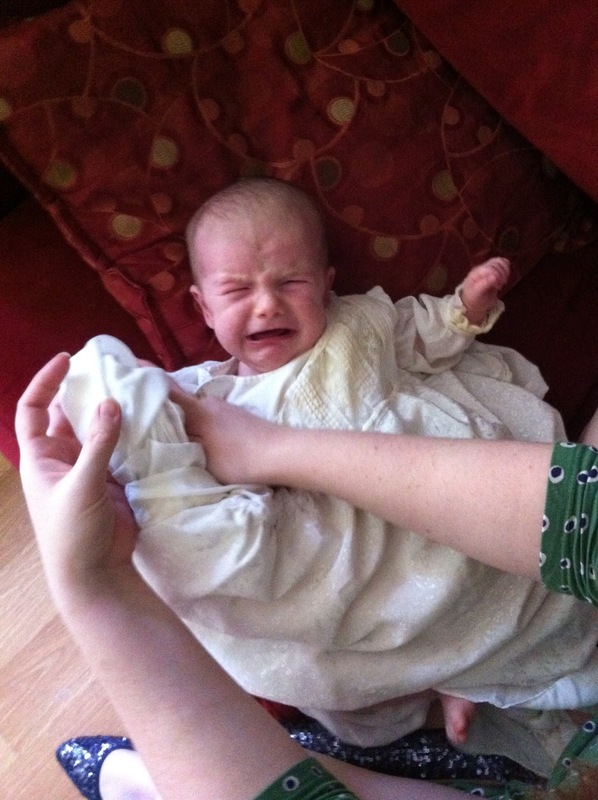 So, you can imagine how I feel about our family's christening gown. My great-great Nana Sarah and Papa Diggles (Irene and Gertrude's parents) purchased it for their first child, my great-great Uncle Edward Diggles (I swear to God I'm not making up that name) in 1896. Since then, 38 babies have worn it, making Luke the 39th. Nana Irene was the 2nd baby to wear it, Nana Dee Dee was the 7th, Mom the 8th, and I was the 31st. I eagerly awaited its arrival in the post. I had seen it once as a small child when my cousin wore it, but since then it had existed for me only as a story kept in a blue box on a shelf. Opening the box and untying the ribbon, I was amazed at what beautiful condition the gown was in. 117 years old; it's survived twenty presidents, two world wars, and the invention of planes, cars, radio, television, and computers. It was 73 years old when man walked on the Moon and 99 years old when the Internet was commercialized. And yet, the gown was snowy white and still soft. The only discoloration was slight, and from generations of infants drooling on the collar and sticking the cuffs in their mouths. The lace was intact, the seams were delicate but tenderly cared for. 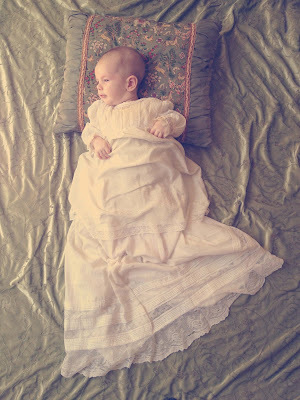 Here and there a hand stitch told the forgotten story of a new mother tearing a sleeve in her haste to dress a babe. Over the decades it has been carefully guarded from light, water, and smoke. Handwritten directions on how to clean it were in the box, along with a spare length of matching lace for mending. 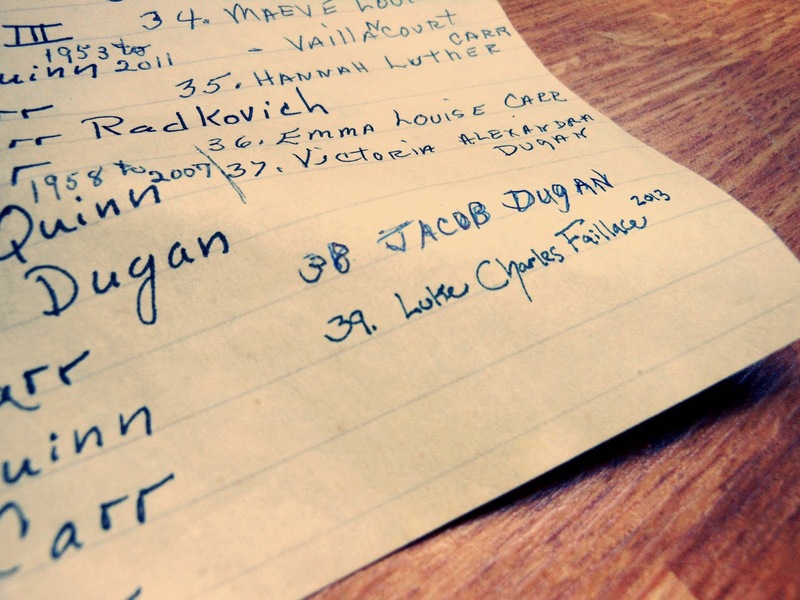 And beneath the care instructions, a list on notebook paper of all the children who had worn it since 1896. The gown arrives, carefully wrapped in its blue box. The list of my Nana, Mom, uncles, and cousins who have all worn the gown. and my godparents Aunt Donna and Uncle Ed. Luke was born, and circumstances kept us from bringing him home to Rhode Island for a christening. 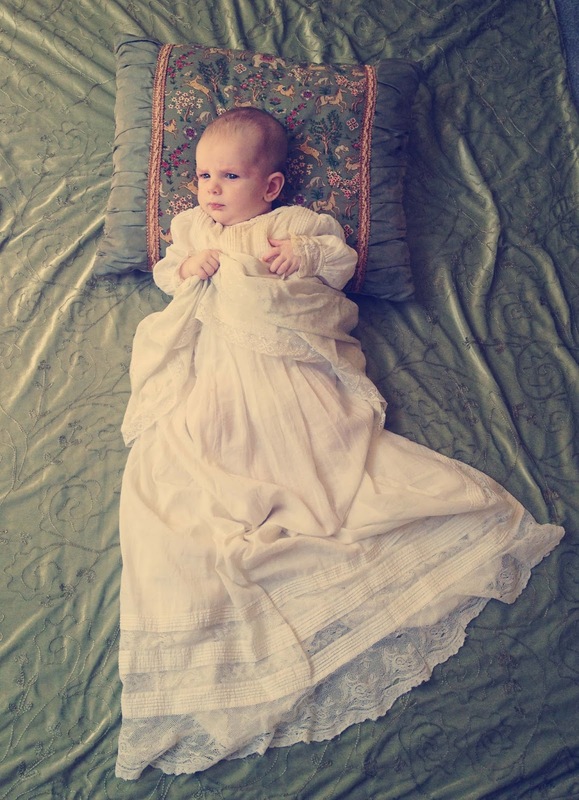 As time rolled by, I feared he would soon outgrow the gown and miss out on this tradition. And so last month Ryan and I dressed Luke in the gown and took portraits. This is the serene, enchanting vision I presented on Facebook for our friends and family. You would have thought I photographed him in a m--f--ing fairy tale. To be fair, it was a perfect storm. We waited until the baby was one overnight growth spurt away from needing us to tie the gown to him with a bungee cord. Seattle is experiencing an uncharacteristically humid summer. And Luke started the afternoon strong by flat out refusing to nap. This is how happy he was in just a diaper. It was all downhill from there. I gained a new appreciation for Victorian mothers and all the buttons they had to find. We gave up two shots in, realizing we just needed to cut our losses and catch as many photos of Luke as quickly as we could. We laid out a soft blanket and a pillow from my studio and clicked the camera and our phones nonstop for a few minutes. "LORD WHY HAVE YOU FORSAKEN ME?" Soon Luke calmed down. Resting on the blanket and pillow, his tears subsided and were instead replaced with contempt-filled glares. What the shot looked like beyond the blanket. Puck stopped by. He was not spared Luke's loathing. In the end, the afternoon photo shoot of wholesome traditions and family portraits I planned turned into 5-7 minutes of blindly snapping shots to be picked over later. 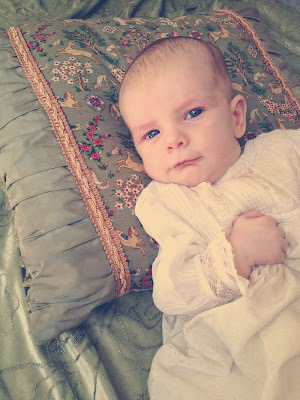 You can definitely still see the hints of his mood that day, but we did manage to get a few nice frames of Luke in the family christening gown. Nice enough to share with Nana and to mark the gown's place in this century. I have to credit my Dad here, for teaching me about curves and levels in Photoshop when I was in middle school. Thanks, Dad! That's how I was able to give the photos that soft light/fairy tale steez, which works well to disguise the fact that they were taken on an old blanket from college in our spare room. This is probably my favorite shot of Luke in the gown. What a sweetheart. Maybe he won't stick me in a nursing home for this after all. When I see this gown, there is a love of family and traditions that I want to impart to Luke. 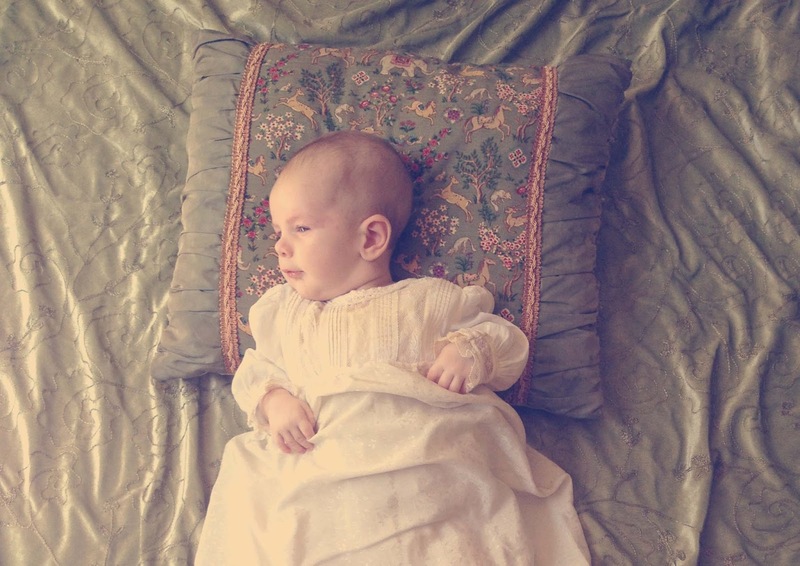 The fabric of people and memories immediately connect him to his great, great grandmother, for the simple fact that she wore it too. 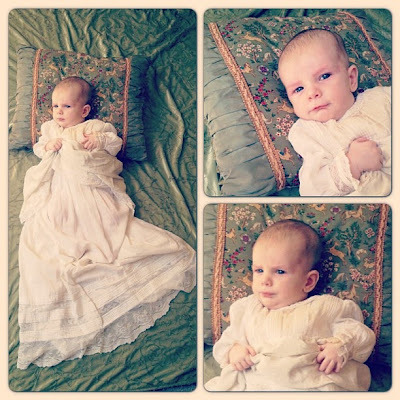 And to her mother, for buying a gown her great, great, great grandson would hate a little over a century later. I find it all beautiful, these echoes of afternoons not really so far apart; when Nana Sarah opened this blue box and Nana Irene untied the ribbon and Nana Dee Dee took out the gown and Mom pulled it over my head and I lead Luke's hands through the sleeves. As Luke grows up, I can show him these pictures and say, "Your Nana Irene and Great Uncle Matthew wore this gown once. They were remarkable people...". And spend some time sharing great stories of them with him. Faith in knowing they would have loved him. Passing on their love for him, even when they're not here right now to show it themselves. I want to find ways to teach him that because he lives, these people live on in his eyes, his smile, and the choices he makes after listening to their stories. That's my favorite kind of immortality. The traits and spirit we carry inherited from people we may never have met, but who shared so much in common with us. Awww! That's a lovely tradition (even if he screamed brimstone and fire for a while). This is such a beautiful post, Georgia. :] Particularly that lovely bit toward the end of the second to last paragraph. But I've got to say, my favourite part is all of Luke's rage. Hahah. That look on his face in the "LORD WHY HAVE YOU FORSAKEN ME?" picture is too much. I am really glad he seems to be as much of a curmudgeon as I am. Hahah.